Eddie Dee Smith earned the title of Matriarch of our Jurupa community by virtue of more than 70 years of continuous service to its people. The Eddie Dee Smith Visionary Committee, like its namesake, is dedicated to stimulating community service and encouraging the educational development of people of all ages and backgrounds in the Jurupa Valley village. 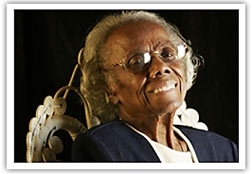 Eddie Dee was the founder of the Riverside Sickle Cell Foundation, active Girl Scout leader, founder of two area churches, a founding member of the North Rubidoux Women’s Club, Docent of The Jensen/Alvarez Ranch Foundation, and political activist, just to name a few services she has provided. The list of all of her service involvements and commitments fill many pages. 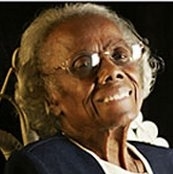 However, of all of the many bright stars in the constellation of her community service accomplishments, her commitment to encouraging every person to fulfill the goal of higher education and community service, no matter who they are or where they come from, may shine the brightest, last the longest, and light the path to a better future for the most people. The Eddie Dee Smith Visionary Committee works to provide grants to help fund the continuing education of deserving students in accredited academic colleges or vocational schools. These grants are awarded to Jurupa residents on the basis of their service to our community and previous academic achievement. All donors will promptly receive a receipt that verifies our tax-exempt, nonprofit status, as well as a DVD of Eddie Dee Smith’s singing and pictures. 1. Applicant must show proof of residence (mail, identification card) in the Jurupa Valley area (the boundaries of the Jurupa Unified School District). 2. Applicant must be currently enrolled in an accredited college, university, or trade school. 3. Letter of acceptance from any of the above institutions will be accepted in lieu of the above requirement for those who have not yet attended such institutions. 4. Applicant must show certified proof of a grade point average of no lower than 2.0 and no grade under a C- from last semester completed at last institution of learning. 5. Applicant must submit a statement of no more than 500 words that describes their educational goals as well as past and current education and community service. 6. Applicant must provide documentation of involvement in some form of community service. 7. Applicant must provide at least 2, and no more than 4, letters of support from individuals who are not family members; which, in no more than 500 words, include the length of time the writer has known the applicant and the compelling reason(s) why they feel the applicant should be awarded the grant. 8. To be considered for a subsequent grant, recipients shall submit an explanation of how the grant money was spent and attach a copy of receipts for the use of said grant.